Some temples have tapping pillars and some blowing pillars producing sound as if in a conch. When struck with a thumb, they produce a bell like sound and their flexural frequencies satisfy the beam modules and cohabitate the architectural pattern with the sound frequencies. Ancient India conceptualized Hindu temples as an epitome of knowledge, art, architecture, dance and music. Each era had a distinctive construction and cultural practice unique in it’s ideology and development. Hindu temples have some of the most exquisite carvings, architecture and styles intrinsic to India. The unmatched architecture contribute to the rich Hindu cultural heritage. They were seen as not mere places of worship, but sacred buildings where religious elaborate practices flourished whose basis was grace and eternal happiness. Upto the 6th century AD, the style of the temple architecture remained similar in the northern and southern halves of India. An example is the Kailashnath temple in Ellora also dedicated to Lord Shiva all made out of a single piece of rock. Temple architecture development was most markedly evolved after this time in the Deccan and Orissa as compared to the north. Some of the earliest temples were rock cut and are mentioned as cave temples. 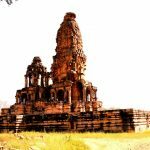 Later the ancient Hindu temples were social hubs with the flourishing of arts, dance, music and combat that were taught and passed down the generations. Each state of India has a presiding deity who is mainly prevalent in almost all of the temples of that particular state. The temples of Tamil Nadu have Lord Shiva and Shakti as the main deities. The finest examples of architectural brilliance are the Brihadeshwara Temple in Tanjore dedicated to Lord Shiva. The sculptures, architecture, painting and the interconnected structures are mesmerizing. The Adikumbeshwarar Temple in the same state is another example where the lingam is believed to have been made by Lord Shiva himself when the lord mixed the nectar of immortality and sand himself. 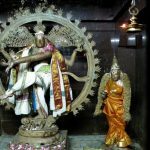 The Tillai Nataraj Temple of Chidambaram consists of the earliest known Devi or Amman shrine, the Nritta (or dance) mandap, and the famed Chidambaram Rahasya. The great splendour in ancient Hindu architecture is demonstrated by the musical pillars present here. A classic example of the 1000 carved pillared temple of the Madurai Meenaksi temple. The state of Andhra Pradesh has Lord Vishnu as the main presiding diety in majority of it’s temples. The unique ancient Indian architecture can be exemplified in the hanging pillar of the Lepakshi temple. 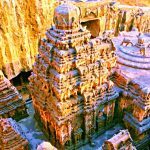 Also known as the Veerbhadra Temple built in typical Vijaynagar style is famed for a wonder. Among the 70 stone pillars, one hangs from the ceiling. The base of the pillar barely touches the ground and it is possible to pass objects from one side to another. The Rudreshwar Swamy Temple in Telangana state is star shaped with 1000 pillars, but no pillar obstructs any person at any point of the temple in line to view the presiding deity. There is a huge carving of Nandi bull made of basalt monolith. The state of Karnataka worships the goddess in all her forms among others, and the Chennakesava Temple of Belur is another unique specimen of the Hoysala architecture. The Narasimha Pillar of this temple comprises of each and every sculpture of the temple carved on it just like an index page of a huge book. The Vijay Vittal Temple of Hampi has 56 musical pillars. The state of Orissa has the main presiding deity as Lord Jagannath or Vishnu, and the Jagannath Temple is believed to have been built by the king Anangabhimadeva. 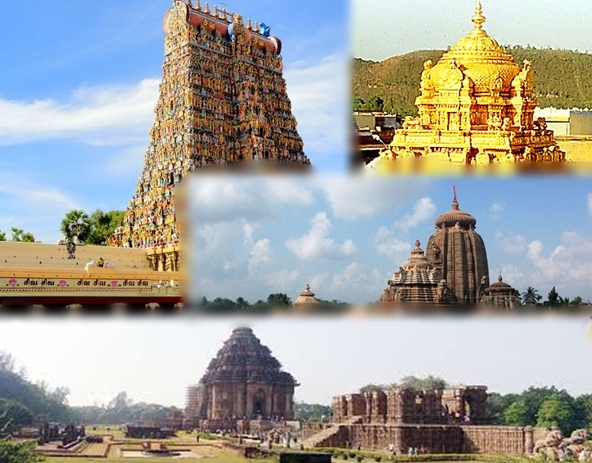 The temple consists of four structures called (a) the Vimana or Bada Deula sanctum sanctorum) (b) the Jagamohan or Mukhasala (the porch), (c) the Natamandir (the audience hall) and (d) the Bhogamandap (the hall for residuary offerings) built in a row in an axial alignment in east-west direction. Another famous temple is the Lingaraj temple dedicated to Lord Shiva built in the similar architectural pattern. The temples of the North are characterized by their earthquake resistant design such as the Kedarnath temple in Uttarakhand, the Pashupatinath Temple (now in Nepal), while the rulers in the south such as the Kakatiyas also used the foundations in materials such as to absorb shocks from all sides. The ancient original Somanath Temple in Gujarat had the unique Shiva Linga suspended in air using magnetic alignment. So huge was the lingam that it is said to have contained a major part of the temple treasure at that time. The temple had gates made of solid gold. 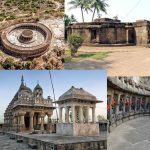 However, the onslaught of the muslims and Islam led to the decadence of the mighty and glorious Hindu temple architecture, its rich ancient customs, art and sciences. 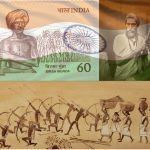 While the greatest loss was in the north, a glimpse of the glorious religious Hindu culture in all its might can still be seen in the Deccan and south India. Lord Shiva – Myth or Master?